During our stay as volunteers at Sothy’s Organic Kampot Pepper Farm, where mangoes grow by hundreds, I couldn’t help dreaming of some recipes combining this delicious fruit and some red Kampot pepper, the fruitier of the three produced at the Farm. It should be said that we have hardly cooked for three months and a half and I am seriously missing it by now, as I love to test, to mix, to match tastes and colours… So, please let me have my dreamtime for a while, and if you feel like it, come along! 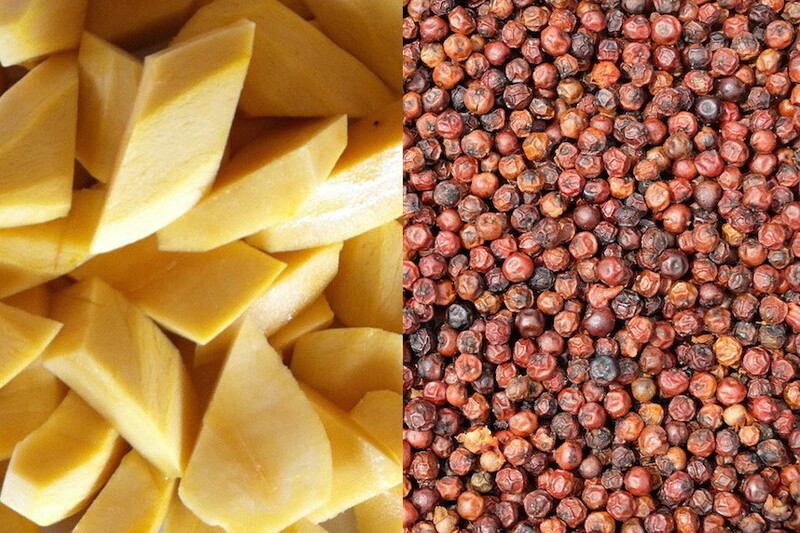 This combination of mango and red Kampot pepper can be surprising at first. However, after a quick research on the Internet, it turned out to be quite a good idea. So, here are three sweet and savoury variations inspired from these researches and to which I added my own touch. Let’s bet you will like them! 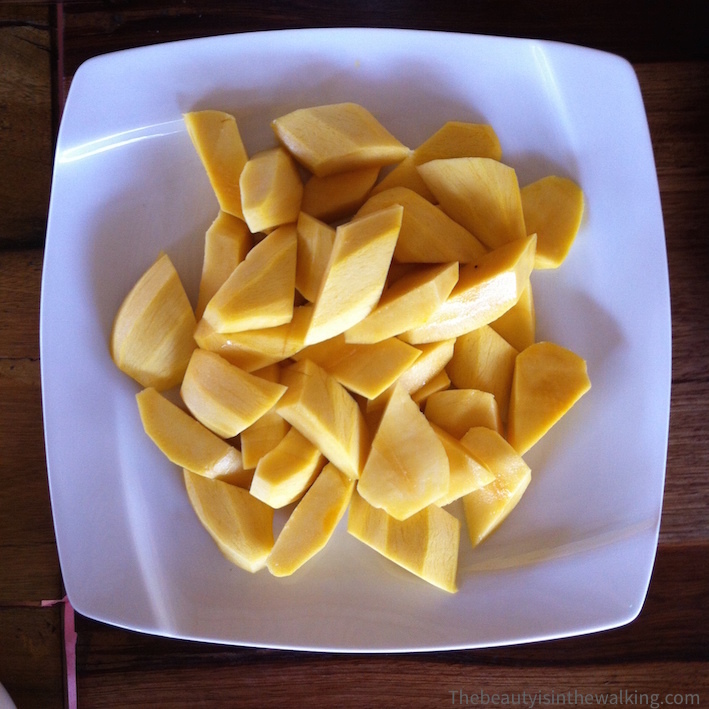 Peel the mangoes and cut them into cubes. 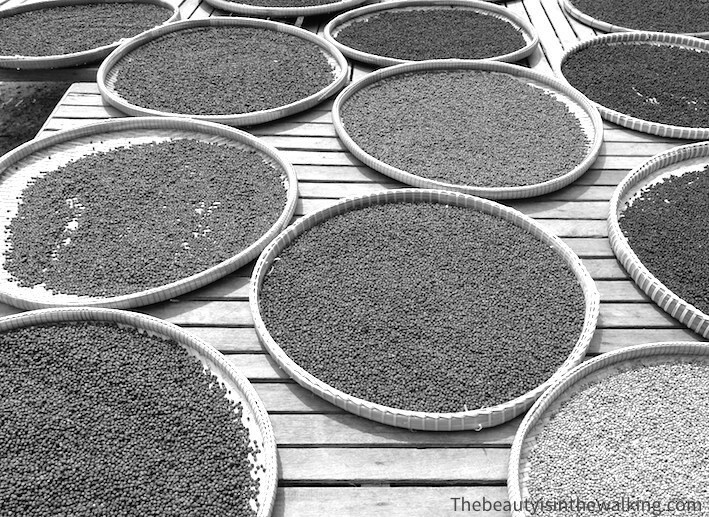 Put them in a bowl with the stones, sugar, red Kampot pepper. 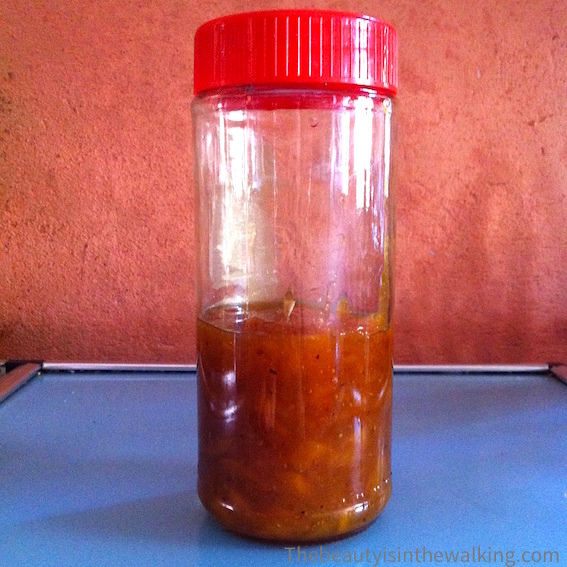 Let stand for at least 2 hours so that the red pepper can infuse. Pour preferably in a copper pan. Bring to the boil, reduce heat and simmer for 30 minutes, without skimming. Remove the stones. Poor into a jam jar and seal it with a metal lid. Clean the jar if necessary and turn it upside down until it has completely cooled down. Store and consume whenever you like. Note : This recipe has been inspired by this one (in French only), which has been adapted in many ways. 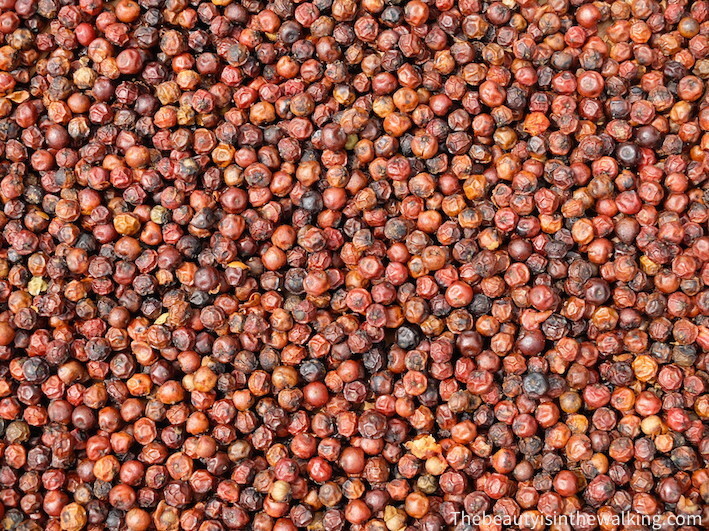 I’ve decided not to put any mint in order to let the Kampot Pepper flavours free themselves: Kampot Pepper is so fruity and fragrant that it deserves exclusive use! However, you can also add some mint and test, especially if you don’t have any Kampot pepper and replace it with standard black pepper. 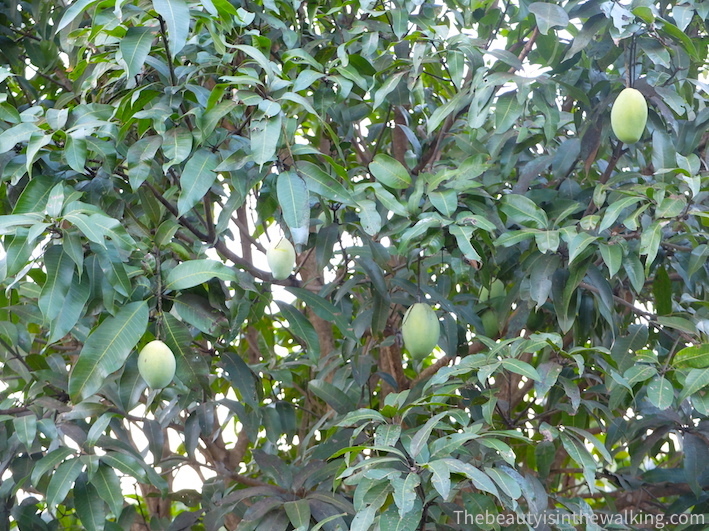 Peel and cut the mangoes in slices, not too thin (1.5 cm thick) and not too long (8 to 10 cm long). Set aside. In a big pan, melt the coconut oil over medium heat. When it is hot, lay the mango slices side by side in the pan and fry them on one side and on the other by turning them over with two forks, for example. Spread some whole sugar (to taste) and let it caramelized for a little while (watch your pan as it can get brown very fast!). Spread some red Kampot pepper all over the fruit. Keep the heat on a little longer to release the aroma from the pepper (important!). Finally add a big drop of rum and flambé the dessert. – This dessert is inspired from an old family recipe of Flambéed bananas, already tried and tested – and even adopted – many times. Here, I made some adaptations by changing a few ingredients, which match very well together– at least so said some sharpened palates. – I’ve chosen to use coconut oil because it brings a nice little taste that goes well with mango, and also because it is known to have several health benefits that butter doesn’t have. Moreover, it stands well to be heated in a pan. Indeed, virgin coconut oil reaches its smoke point at 177° C (350 °F) (which is less for sunflower oil for example), knowing that pan-frying doesn’t exceed 180 °C (356 °F). Cut the red cabbage in thin slices. Grate the carrot. Cut the half avocado in slices widthwise. Wash the lettuce and cut the bigger leaves in smaller pieces (by hand or with scissors; it’s up to you). Peel and cut the mango in slices (the same size as for the avocado). In each plate, make a bed of lettuce, then put a mix of grated carrot and minced red cabbage, on top of that arrange alternatively in a radial shape some slices of avocado and mangoes. And spread some pomegranate grains all over. Sprinkle toasted sesame oil and balsamic vinegar. Add freshly ground red Kampot pepper and a pinch of sea salt (to taste). And finish the decoration by adding a few black sesame seeds on top. Taste with your eyes first. 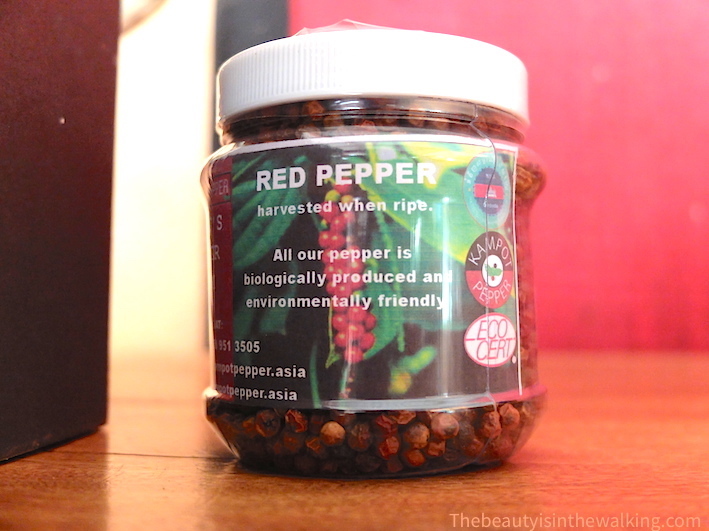 Are you also a pepper addict? How do you cook it? Share your craziest associations and best recipes in the comment section!